PAT has agreed to assist Cobham SATCOM with type approval testing of its Aviator UAV200 Satcom terminal on the Mwewe Unmanned Air Vehicle. PAT agreed to assist Cobham SATCOM with type approval testing of its Aviator UAV200 Satcom terminal on the Mwewe Unmanned Air Vehicle (UAV). The Mwewe UAV is a ¼ scale model that was built to assist with wind-tunnel testing for AHRLAC. Leveraging on the integration capabilities that PAT has on UAVs, further development of the base UAV auto-pilot and control systems was done for the specific flight dynamics of Mwewe, setting the ground for further exploitation of PAT’s UAV capabilities in different applications. 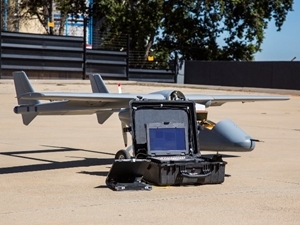 Cobham SATCOM has been working on the development of a very small, low weight Inmarsat Swift Broadband terminal specifically targeting small tactical UAVs. The intention was to allow airframes with a long endurance to optimise their use in Beyond Line of Sight mode (BLOS), using a lightweight SATCOM terminal (weighing only 25% of previous generation units) with communication via the Inmarsat satellite network and base-station. Strategically valuable BLOS data band-with is now available to the smaller long-range UAV operator. The project was successfully completed in parallel to other UAV projects, showcasing the commitment of the PAT workforce to be part of exploring new technology to expand on our product offering to both existing as well as potential UAV clients in the future. Cobham SATCOM has now obtained type approval by Inmarsat and taking on orders for this product. With another homegrown product offering available on PAT’s doorstep, the “We make it African” slogan has been demonstrated in producing a world-class product offering. PAT is confident that with such new technology being integrated, tested and qualified that it can secure future business in the UAV domain for the benefit of its clients. The project wishes to express their gratitude to all the PAT staff who has in some way or another assisted, the South African Air Force Airworthiness Board as well as Command Centre, for approving our Certificate for Flight Trails and using their restricted airspace, as well as Etienne Toerien and his staff @ Mongena Lodge in the Dinokeng Conservation area for PAT of their tarred runway.